The Tastemaker Top 10 is a collection of 10 questions asked by me and answered by some of my favorite bloggers. Here they will tell you a little bit about themselves, their blogs, and of course, their favorite foods and restaurants. 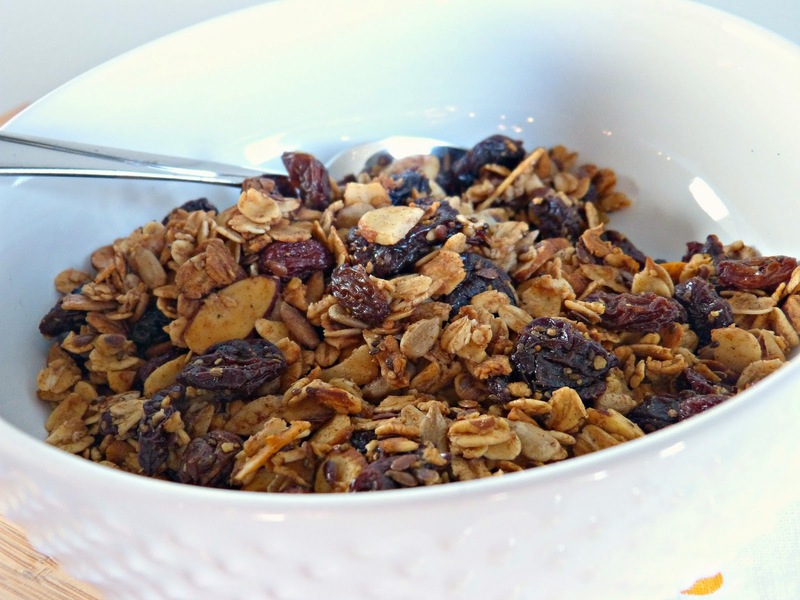 I'm excited to introduce you to Jillian of Cornflake Dreams today! Jillian was one of the first Chicago bloggers that I followed when I started writing A Squared and she has just moved to the lovely and charming Charleston, SC. I love following along with her adventures there and below are her answers to my Tastemaker questions from just before she moved. Check it out! Location: Chicago, IL ... soon to be Charleston, SC! In a few sentences, tell us a little bit about your blog: Cornflake Dreams is a travel and style blog. I blog about all the things I love: traveling with my husband, food, shopping, and yoga. 1. Favorite meal, food, or cuisine: I love Mexican and Persian Food and I am a little obsessed with sandwiches. I also have a killer sweet tooth (more on that later). 2. Least favorite meal, food, or cuisine: Seafood! 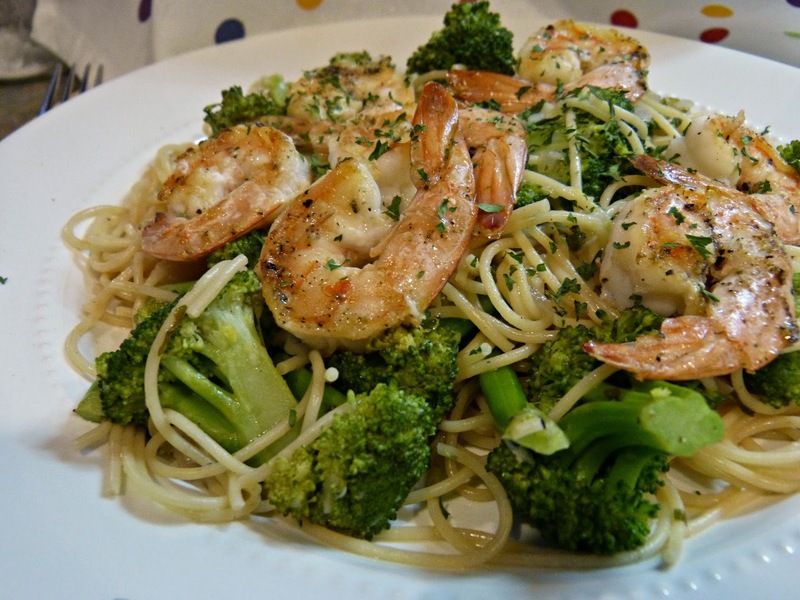 I can't stand the smell or taste of seafood-- which is a shame because I know it's a healthy option. 4. Favorite restaurant outside of your city: Cupcake in Charleston, SC - it's my absolute favorite place to get cupcakes. I love the Lemon Blueberry and Carrot Cake with cream cheese frosting flavors. 5. Favorite food memory: My grandpa always made me biscuits and gravy (with sausage + lots of black pepper) for breakfast when I visited. Now whenever I eat them I always think of my grandparents. 6. Favorite guilty pleasure food: pumpkin pie, carrot cake with cream cheese frosting, flaky croissants, peanut butter, chocolate chip cookie dough, white chocolate chip macadamia nut cookies, and chocolate cake donuts. 7. Favorite ingredient (something you love to cook with, or something you see on a menu and know you have to order): Feta cheese, cilantro, lemon (together OR separate). 8. Favorite kitchen tool, utensil, product, etc. : My HUSBAND! He is the chef in our house... I am the sous chef ...meaning I reheat his leftovers on the weekends. 9. 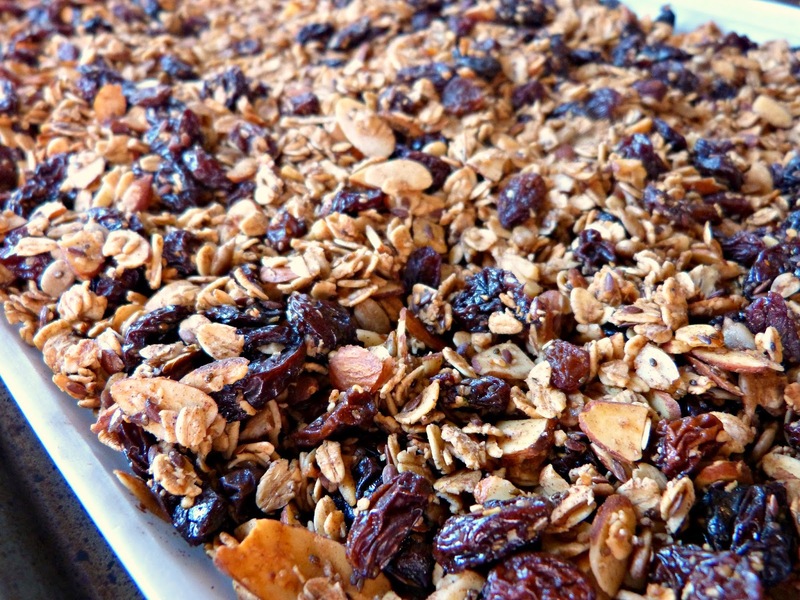 Favorite recipe: My great grandma's date nut bread. 10. 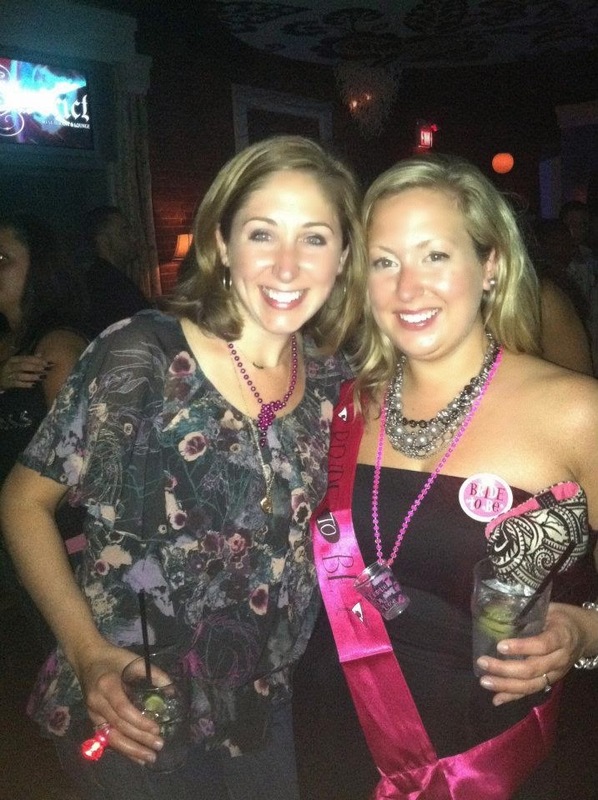 Favorite thing about blogging: I love the friendships I have made online and in real life. Blogging is such a wonderful way to meet new people with similar interests. Long Distance Loving - Ali is one of my first blogging friends -- she is even sweeter in person. Dancing Branflakes - A ballet dancer who loves food. Aspiring Kennedy - I absolutely love Lauren's travel, baby, and food photos. A Cup of Jo - The first blog I loved -- and the one that inspired me to start blogging. Thanks so much for your thoughts, Jillian! I'm not sure what it is, but we are having a real seafood moment right now. Maybe we are having New England withdrawals or maybe it is because there is nothing like fresh seafood in the summertime, but Alex and I have been eating a lot of it lately-- at home and when we're out. In fact, I have dined out at several new (to me) seafood spots around Chicago lately. Who knew that there were so many and that they were all so different? Today I wanted to tell you about two seafood spots on the west side of Chicago. Stay tuned for a follow up post or two featuring other seafood restaurants around the city coming soon! 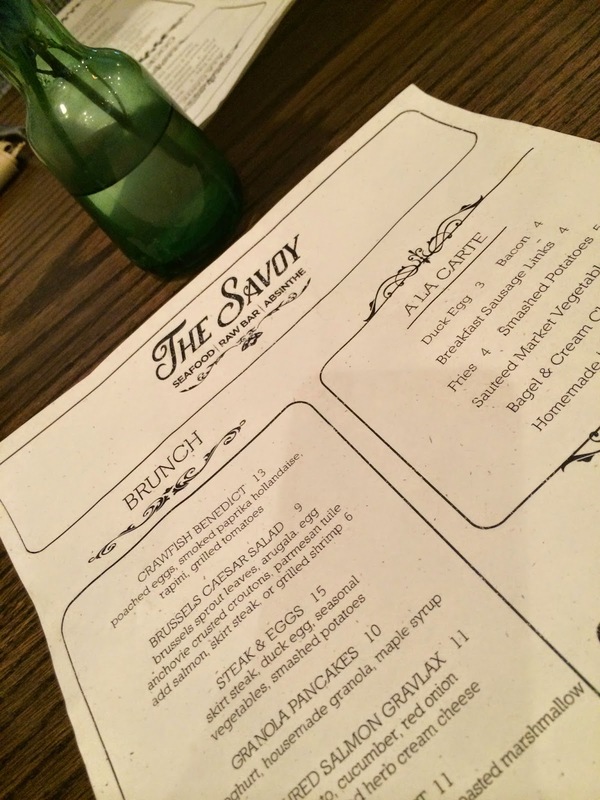 Alex and I stopped into The Savoy for a quick brunch one recent weekend and truthfully, I wasn't sure what to expect. The Savoy sits just outside of the highly trafficked restaurant-packed area around the Damen/North/Milwaukee intersection and on the outside is pretty nondescript. One or two friends had mentioned dining there and since we were in the neighborhood we decided to give it a try. The restaurant has a simple laidback vibe and decor that was great for a quiet Sunday. The menu is heavy on the seafood and many of the menu items are creative takes on more traditional dishes with global influences from French, Mexican, and various regional American cuisines noticeable throughout. I perused the menu and was immediately drawn to the crab cake BLT-- because I will generally eat and enjoy anything with a crabcake on it. But I was torn between that and the shrimp po' boy, which came highly recommended by our waitress. Alex went with the BLT (which looked delicious) and I ordered the po' boy, which definitely lived up to my expectations. The baguette was piled high with five sizable and perfectly grilled shrimp, herbed ricotta spread, spicy slaw, tomato, and a pickled pepper that was so hot my mouth felt like I was breathing fire. Once I removed the pepper though, the sandwich had just the right amount of heat for me. The tangy spicy slaw with the rich ricotta balanced really well with the shrimp that I had no trouble finishing this sandwich off. My po' boy was served with a side of homemade potato chips seasoned with Old Bay, a traditional New England seafood seasoning blend. They were crispy and tasty, but Alex insisted on ordering a side of French fries to share which was also a great idea. Do you remember those orange-colored seasoned French fries they served in your high school cafeteria that were so greasy and gross that they were good? That's what these fries reminded me of-- but in a good way. They were super seasoned and flavorful and they seemed almost breaded, which is unique for fries. They were clearly fresh out of the fryer because they arrived to our table piping hot and crispy. I would love to go back and try dinner at The Savoy sometime. In the meantime though, if you find yourself in the neighborhood and you're looking for a brunch that's special, but still relaxed then wander over to The Savoy and enjoy! Bow & Stern is newer to the Chicago restaurant scene and definitely something out of the ordinary for its location in the West Town/Noble Square area. This neighborhood is a bit up and coming, but restaurants like TWO and Mexique have helped to put it on the culinary map-- and now Bow & Stern has joined the mix! Bow & Stern is a surprisingly large restaurant with a laidback atmosphere and a lively bar crowd. We sat at the bar for a bit while we waited for our table and noticed that this has quickly become a favorite spot among locals. Many of them knew each other and the bartender, which always makes a restaurant feel a bit more comfortable. Once seated, we perused the appetizer menu and-- don't judge-- since neither Alex or I enjoy oysters (I know, who goes to an oyster bar and doesn't order oysters?) we both agreed to order one of the only seafood-free items on the whole menu. The Burrata & Chips just sounded so good and when the waitress praised our order I knew we made the right decision. This photo does not do the dish justice because it was seriously delicious. I could have been content snacking on this dish all night. Brussels sprouts, kale, sunchoke, cauliflower, oyster mushroom, are cooked until crispy, drizzled with an herb sauce and grana Padano, and then served warm with a generous portion of creamy Burrata. Burrata on its own is amazing, but served with these crispy salty vegetables it was really out of this world. Even Alex, who made a face at the idea of Brussels and kale, was digging in and fighting me for the last few bites. Put this on your Must Order List. Like crab cakes for me, if Alex sees a lobster roll on the menu there is a 99% chance he will order it. The poor guy's face fell when he picked up his menu at Bow & Stern to find "SOLD OUT" stamped in red next to the lobster roll. 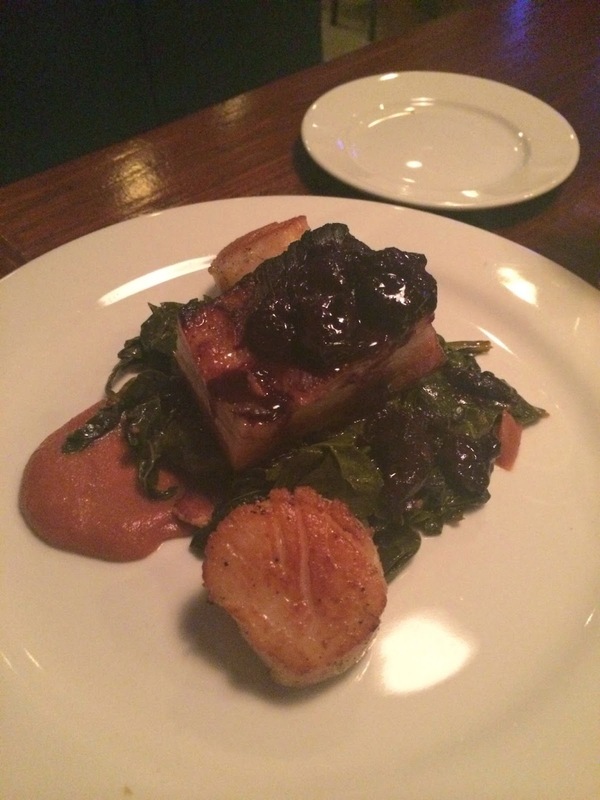 So instead, he went with Bow & Stern's dressed up version of surf & turf: Rolling Meadows Farms pork belly served with seared scallops, braised greens, date gastrique, and cherry mojo. I sneaked a bite off his plate and loved that they incorporated fruit into the sauces for a little sweetness to pair with the salty savory pork belly. The scallops were seared and seasoned just right and the addition of the greens rounded the whole plate out. And speaking of my undying love for crab cakes, this was my choice for dinner. 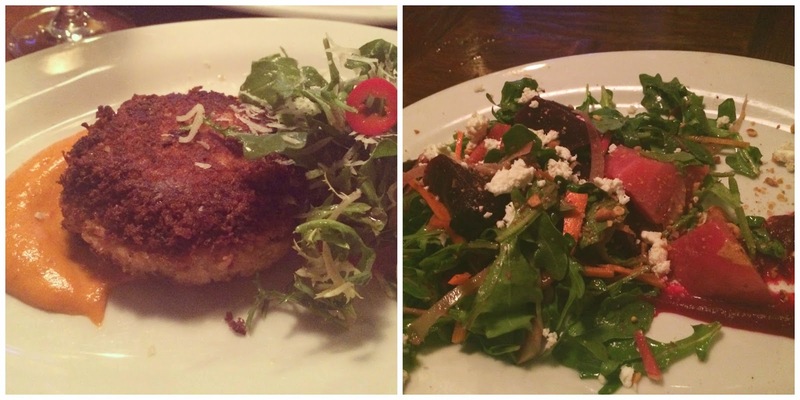 The crab cake was on the appetizer menu, so I decided to pair it with a salad and call it an entree. The crab cake was a really good size and was super meaty, crispy on the outside and moist inside. Bow & Stern serves it with their special Bow tartar sauce (which has an orange hue from what I imagine is an added spice or hot sauce?) 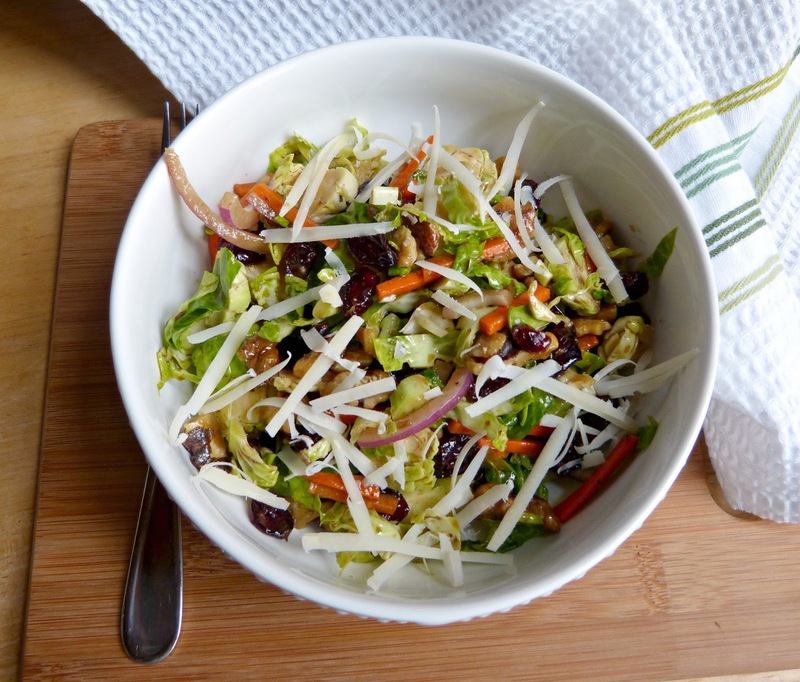 and a small simple salad of arugula, thinly sliced red chiles, and Grana Padano. Honestly, it was satisfying and balanced enough that it could totally suffice as an entree. I was famished though, so the salad I ordered was key-- and really tasty! The beet salad at Bow & Stern is super fresh and delicious. Huge chunks of pickled beets (both the traditional deep red ones and a lighter pink variety) are tossed with peppery baby watercress, toasted nuts, and shredded carrots in a black garlic Cabernet vinaigrette. It's all plated with creamy whipped goat cheese and an orange beet puree. There aren't that many ingredients, but they all work super well together: tangy beets, peppery greens, and creamy goat cheese... it's just perfect. So, you probably think we were full by now, right? Wrong. We definitely wanted a little something sweet and were torn between sharing a slice of their housemade key lime or peanut butter pie. Alex usually goes key lime, but the coconut crust (he's not a fan) pushed him in the other direction. Oh, I am so glad it did! Grandma Greene's Peanut Butter Pie was incredible. The creamy peanut butter filling was whipped to become super light and airy, which made it feel a little less rich. It's layered on top of an Oreo crust (for a little pop of chocolate) and the top is drizzled with a combo of caramel sauce and creme anglaise. 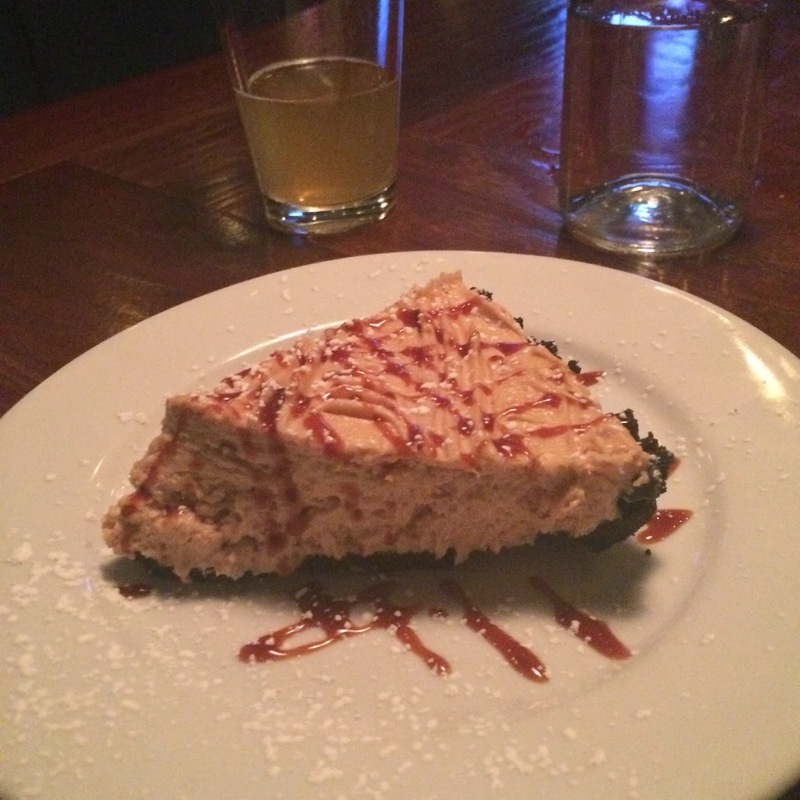 We scraped the plate clean so be sure to save some room during your next trip to Bow & Stern-- if you love (or even like) peanut butter, you will not want to miss this pie! Although the name suggests that this is a food-centric street fest, I think this summer festival is best described by its old name Rock Around the Block. It's a small street fest with a handful of local restaurants and bars selling food in addition to some of the festival standbys that you'll see all summer long. The real draw at this festival is definitely the live music. With two stages and festival favorites like Mike & Joe, Wedding Banned, and Two White Crew, and our new favorite the Hot Sauce Committee on deck, it's definitely one of the most fun musical line ups of any Chicago street festival I have attended. Back to the food, Alex was in junk food heaven at this festival trying a slice from Jet's pizza and these out of control brisket-topped fries from Mrs. Murphy's & Sons. The girls and and I went in another direction and tried one of those festival regulars that I mentioned: College Corn. I saw tons of people walking around the Taste of Lakeview with these giant ears of corn and decided I needed to try one for myself. 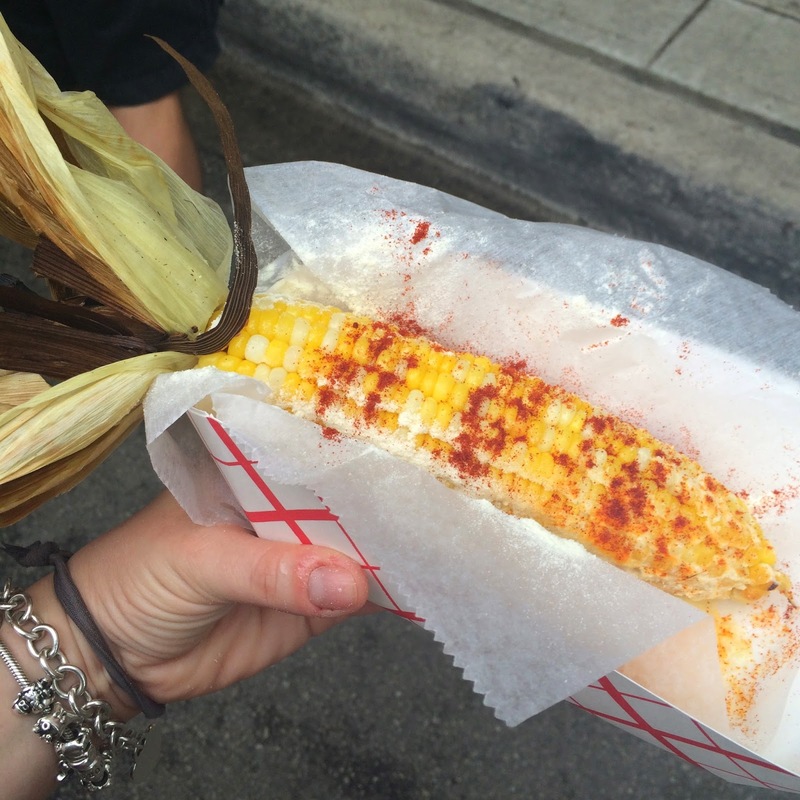 College Corn sells fresh ears of corn cooked and covered in butter, which you can then top your own combination of a variety of seasonings. I went with Parmesan and chipotle and it was delicious! I have a bit of a love-hate relationship with the Taste of Chicago. 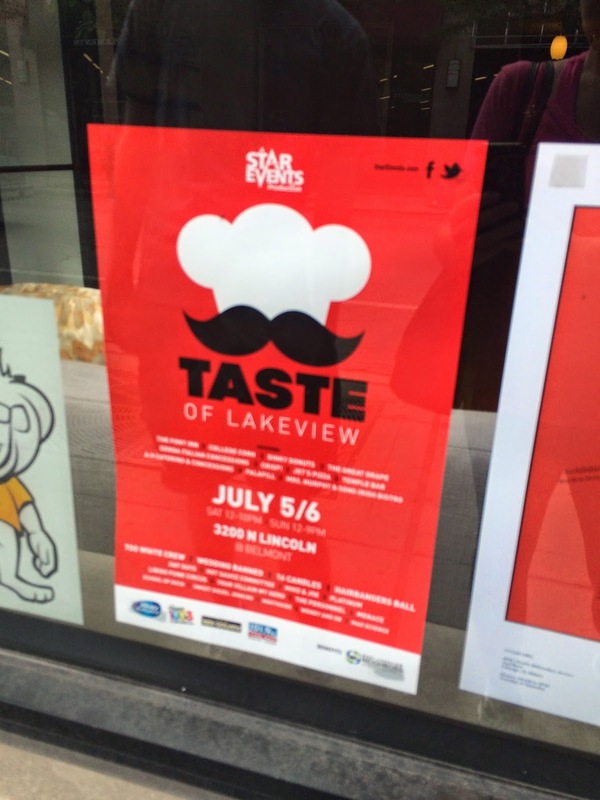 It is by far the largest of the food-centric festivals you'll find in the city with a wide variety of vendors and restaurants from all around Chicagoland there. From grocers to food trucks to high end restaurants, there is a little bit of everything here-- along with some pretty major musical acts headlining the festival. The downside is that it is typically very crowded and is notorious for getting a little rowdy. That said though, it's totally worth a visit-- and I would recommend a weeknight or earlier in the day on Saturday and Sunday. 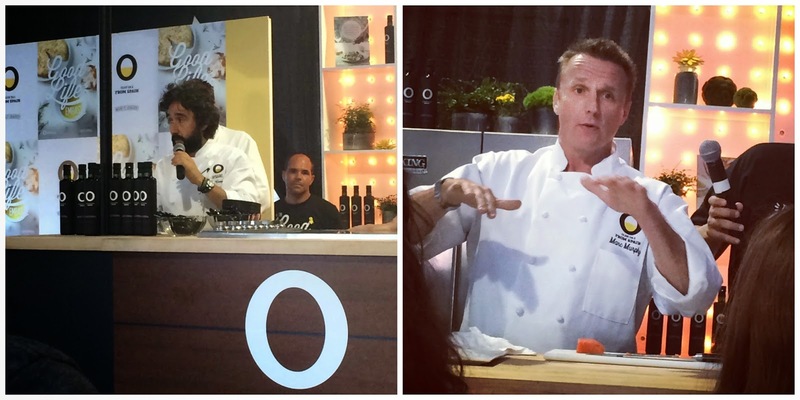 I have been to the Taste a few times before and wasn't planning on going this year (since we had just moved into our new place), but when Olive Oils from Spain reached out and invited me to visit the Good Life Embassy tent for cocktails and a cooking demo I couldn't pass it up! Spokes-chefs Diego Guerrero and Marc Murphy were both on hand that evening for live cooking demonstrations featuring olive oil from Spain. You may recognize chef Marc Murphy from various appearances on the Food Network, including his regular gig as a judge on Chopped. I got the chance to chat with him after the demo and he was as kind and funny (and cute) in person as you'd hope! And while I am a big fan of chef Murphy and the salmon crudo that he prepared in the demo was ery good, chef Guerrero's dish was definitely my favorite! His pan y huevos was rich and delicious: soft cooked eggs wrapped up in thin crispy bread and serrano ham surrounded by a rich sauce of pureed potato and olive oil. So good! Me with 2 drinks: A sight not often seen. 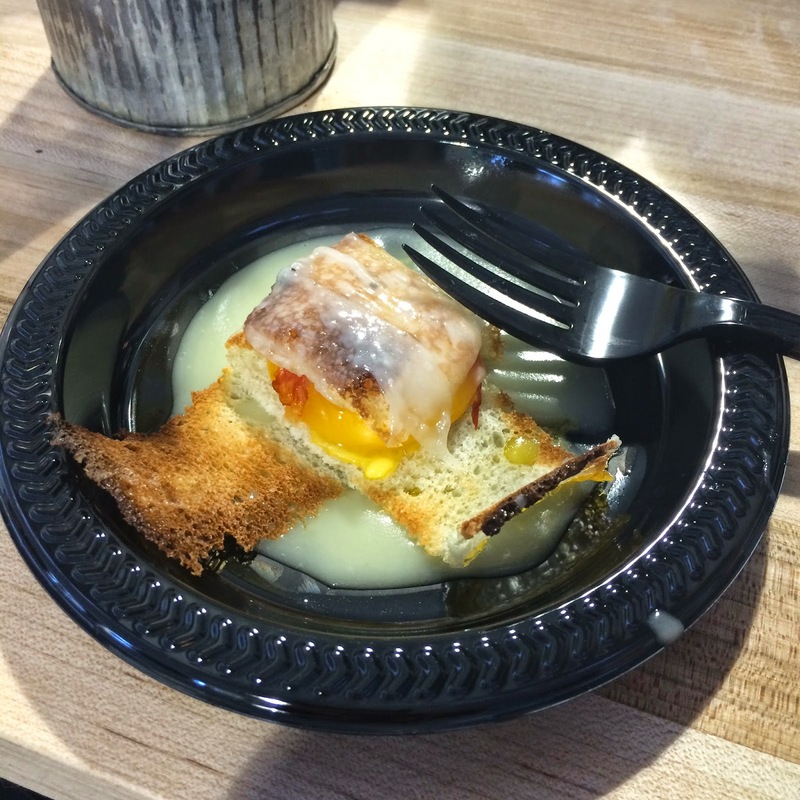 First up: We tried The Slide Ride, a local food truck specializing in sliders. Alex ordered the Jalapeno Jack sliders, while I went for the Bacon Baby and we tried one of each. I'm not usually a fan of spicier food, but I really liked his choice-- they had a great kick of heat from both the pepper jack cheese and the pickled pepper slaw. And you can't go wrong with the combo of cheddar, bacon, and mustard caramelized onions on my slider pick! Next up, Alex headed over to LeaderBar's booth for a slider so spicy it came with a disclaimer and he drank 2 cans of Coke trying to cool down. The El Diablo is topped with pepper jack cheese, habanero relish, jalapeño, grilled onions, and Sriracha mayo. Needless to say, I didn't go near this one! Instead, I opted for a cup of delicious baked mac and cheese from Reggie's. It was simple and saucy and a nice break from the burgers! Last, but not least: My favorite burger of the evening. Cortland's Garage earned the top honors at last year's Burger Fest and having never been, I wanted to check it out. And I would have to agree! The Cortland Street burger is cooked exactly how I like it (evenly, lean, and not rare) topped with white cheddar, crispy bacon, avocado, crispy onion strings, lettuce, tomato, and mayo. Alexis tried their mac & cheese burger which also received rave reviews. 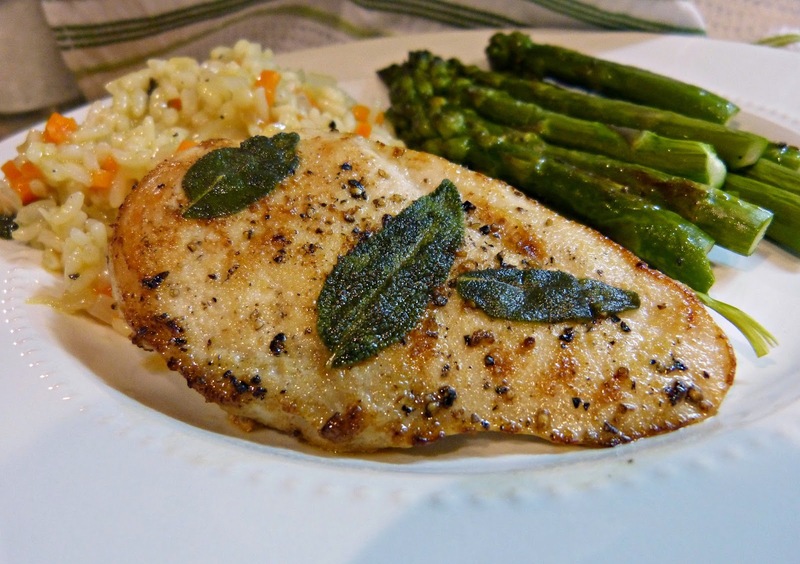 Yesterday I shared with you a simple and elegant recipe for chicken breasts seasoned (and decorated) with fresh sage leaves. 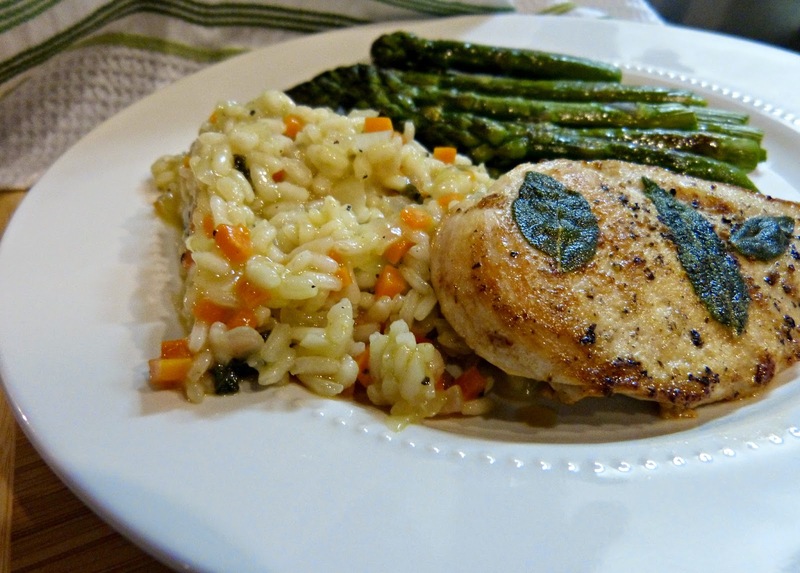 Today, I wanted to share a delicious side dish that pairs perfectly with that chicken: carrot & sage risotto. I have had so much fun experimenting with variations on my basic recipe, but this risotto is really different and wonderful. It has nice sweetness from the carrots and that deep flavor of fresh sage. 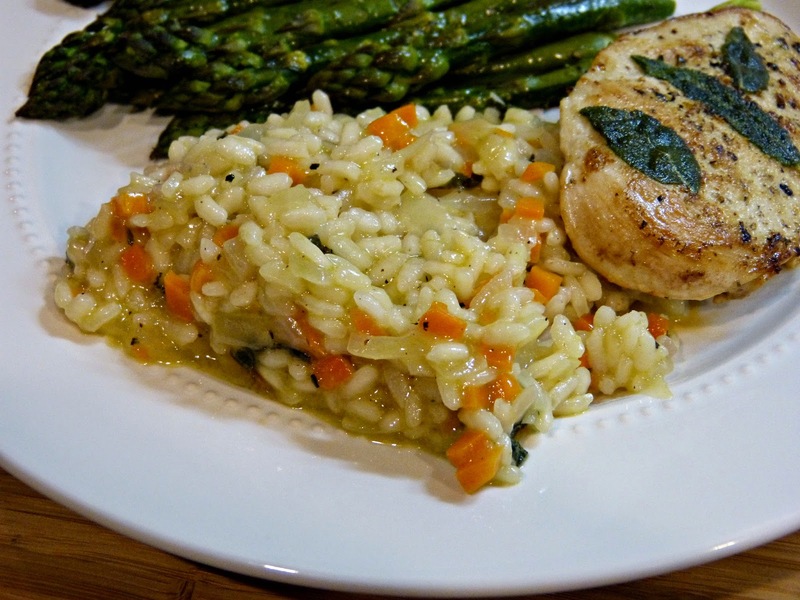 These flavors work together really nicely to lighten up the risotto, which can often be a very rich dish. It's also super versatile, so this risotto makes a great side dish for virtually any protein, for some grilled vegetables, or on its own with just a little grated Parmesan. It was fun to let the carrots shine here. They don't often get to be the star of the show, right? Usually you're throwing them into a soup or a sauce with celery and onions or adding them to a vegetable stir fry for a bit of color or to a slow cooker because they are one of the only veggies that can withstand several hours of slow cooking. In this risotto though, the carrots are the stars. In a large saute pan heat 2 Tbs. olive oil over medium heat. Add the onions, carrots, and 1/2 of the sage and saute until tender (make sure they don't brown! ), about 3 minutes. Add the Arborio rice and stir to coat with the onion mixture. Add the wine and simmer, stirring until it has almost completely evaporated, approximately 3 minutes. Add 1/2 cup of chicken broth and stir constantly until the broth has almost completely absorbed, for 2-3 minutes. Continue stirring the rice and repeat the process of adding 1/2 cup broth at a time. Allow each 1/2 cup of broth to absorb before adding the next. Continue stirring to cook until the rice is chewy and firm. Remove from the heat. Stir in the remaining oil, reserved sage, grated Parmesan, and season with salt and pepper. Serve immediately. Sometimes the best recipes are the ones that happen by accident. I have recently been on a risotto kick (see this recipe and this one too) and had tons of Arborio rice in my pantry that needed to be used up. Risotto, in my opinion, usually becomes the star of the show when you're serving it so I try to keep any proteins or vegetables that I serve along with it pretty simple. I had an idea for a summery carrot risotto and decided to quickly sear a few chicken breasts to serve with it. In the middle of my chicken prep, I noticed a few leftover sage leaves in my fridge and decided to add them to the chicken breasts. What a game changer! Sage is one of the best flavors to add to poultry and when it's fresh, it's even better. A little butter, garlic, and white wine rounds is a classically simple and delicious flavor combination. In the cooking process the whole sage leaves basically adhere themselves to the moisture of the chicken breasts and they look so beautiful seared against the browned chicken. And the pan searing process helps the sage leaves to develop a deep herbaceous flavor. Oh, and come back tomorrow for that carrot risotto recipe-- together it's a perfect meal! Add olive oil and butter to a cast iron skillet or other oven-proof pan. Melt over medium high heat and swirl to coat. Season chicken breasts on both sides with salt, pepper, garlic powder. Gently press 3 sage leaves into each side of the chicken breasts. The moisture from the chicken should fasten the leaves to each side pretty securely. Add the chicken breasts to the pan and cook until golden brown on both sides, about 2-3 minutes on each side. Carefully pour the white wine into the pan and place the pan in the heated oven. Bake for 8-10 minutes or until chicken is cooked through and wine has reduced. The Tastemaker Top 10 is a collection of 10 questions asked by me and answered by some of my favorite bloggers. Here they will tell you a little bit about themselves, their blogs, and of course, their favorite foods and restaurants. Today we are talking to Lauren of the lifestyle blog Lakeshore Lady. 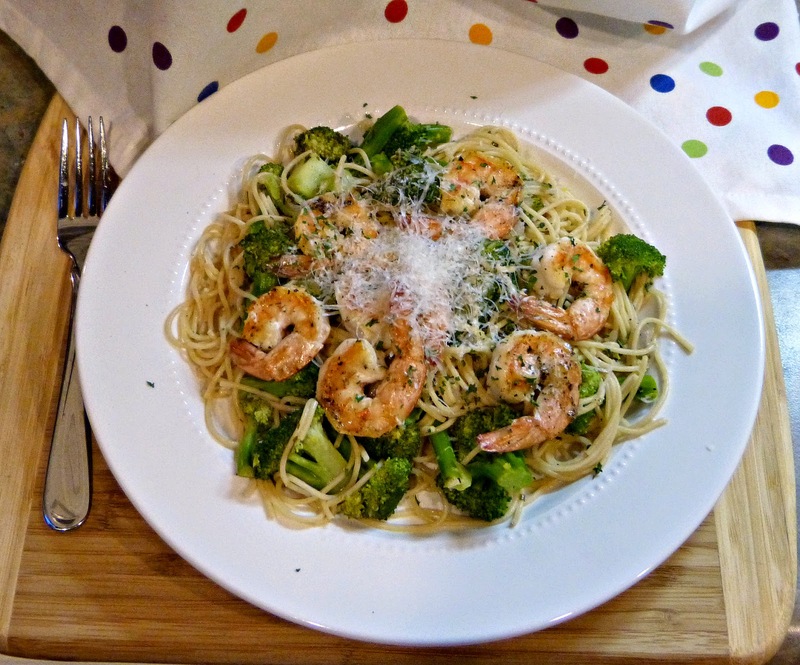 Like me, Lauren loves to cook and share recipes on her blog (especially Italian food!) 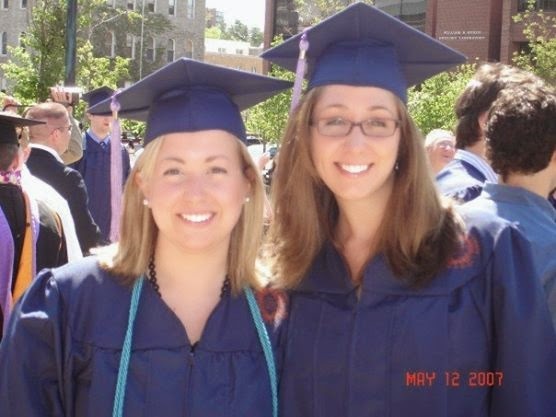 and she's also one of a handful of fellow Syracuse alums living in Chicago. Go Orange! 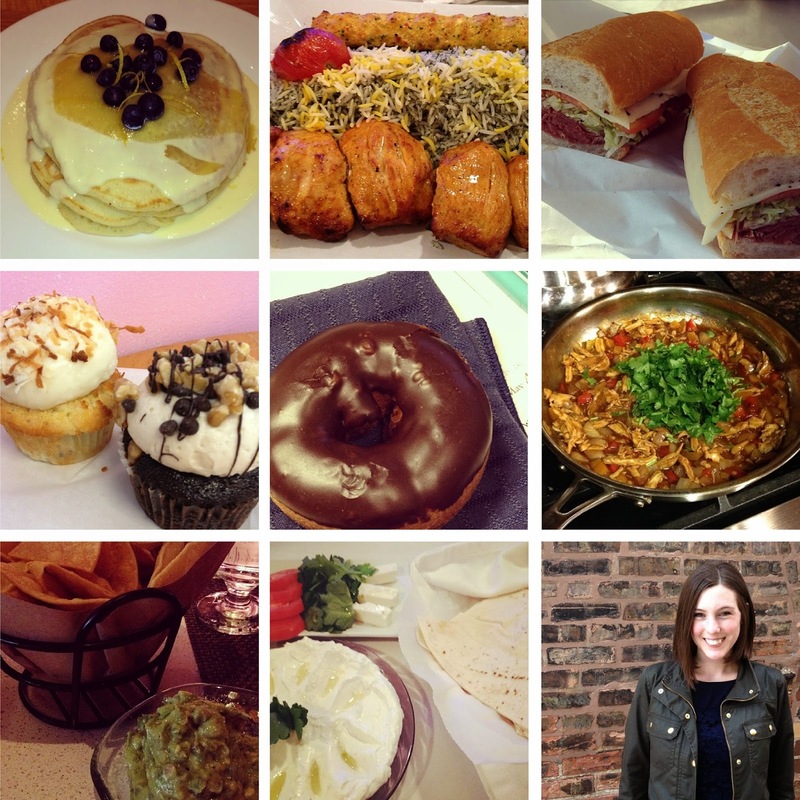 In a few sentences, tell us a little bit about your blog: Lake Shore Lady is my food and fashion blog. It showcases my personal style, favorite trends, and other inspirations. 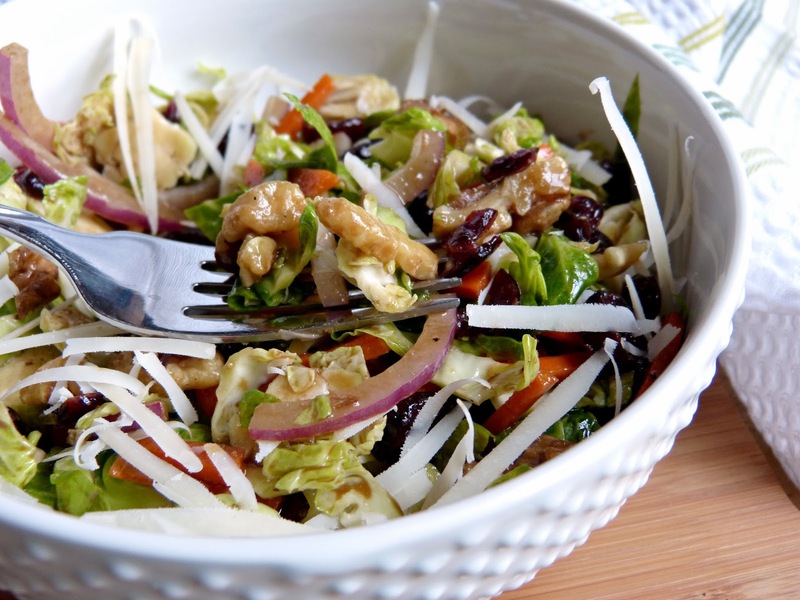 My easy and (mostly) healthy recipes come with step by step pictures, so you an easily recreate the dishes at home. I like to think there's something for everyone! 1. Favorite meal, food, or cuisine: I grew up learning how to cook Italian food from my Mom and Nana, so I think that will always win, no matter what. 2. Least favorite meal, food, or cuisine: Red meat and I don't get along anymore, but if we are talking about foods I don't actually like... I've never been able to get on board with mayonnaise or cold cuts. I was that kid who got a PB&J instead. 3. 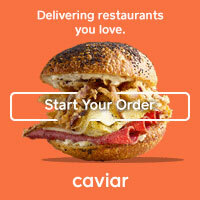 Favorite restaurant in your city: There are so many great restaurants in Chicago, but I think I have to give it to RPM Italian. I'm pretty sure anyone who has ever met me has heard me talk about their Homemade Ricotta. Plus the Lobster Caprese, Brussels Sprout Salad, Bucatini Pomodoro... it's everything my dreams are made of. 4. Favorite restaurant outside of your city: Westville in New York City. I get a Market Plate there every time I go back to visit NYC. If you are a fan of vegetables, this place is for you. 5. Favorite food memory: Almost every Thanksgiving I make Stuffed Mushrooms with my Mom, and I make them with my Nana almost every Christmas. Even when I make them myself, the smell of garlic and mushrooms sautéing brings me back to both of their kitchens. 6. Favorite guilty pleasure food: New York Pizza! But since that isn't as readily available to me in Chicago, wings are also up there. They're the perfect thing to eat while cheering on the Blackhawks!! 7. Favorite ingredient (something you love to cook with, or something you see on a menu and know you have to order): Recently, one of my favorite ingredients to cook with is kale. It's so versatile and also so good for you! If I'm at a restaurant, it's probably mussels. I'm a sucker for a pot of mussels. 8. Favorite kitchen tool, utensil, product, etc. : My Julienne Peeler! I get (embarrassingly) excited when I make Zucchini Noodles. 9. Favorite recipe: My family's Vodka Sauce recipe is killer. 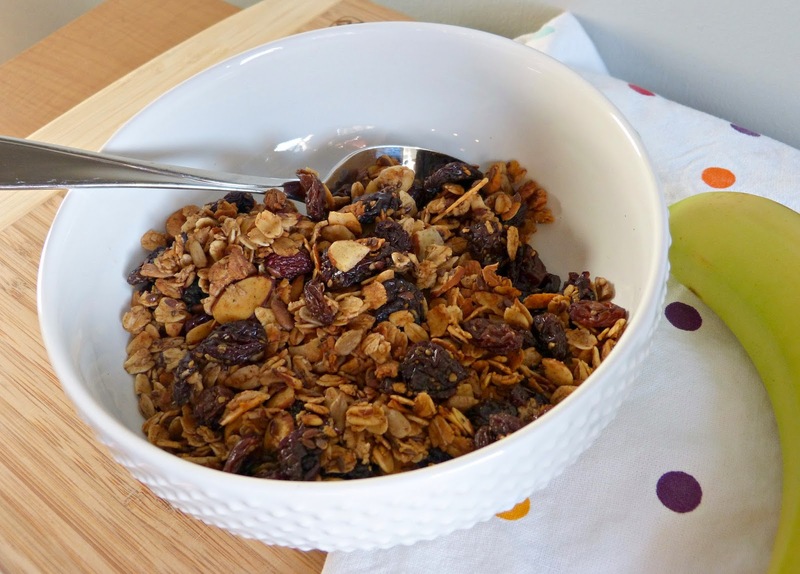 It's my favorite comfort food and it's super easy to make for a group. 10. Five favorite blogs/blogs that A Squared readers should know about: As for food blogs, I never miss How Sweet It Is, Oh My Veggies, Cookie and Kate, The First Mess, and Love & Lemons.